Steven Guttman, the founder and chairman of Uovo, launched his collections storage company in New York three years ago out of necessity. As a buyer of space-gobbling furniture and design, there was no facility that met his exacting standards. So, after 40 years in banking and real estate, Guttman built his dream warehouse in Long Island City, Queens with museum-level security and environmental controls and concierge-like service. Today, with 500,000 sq. ft across three facilities, Uovo houses the collections of museums, foundations, galleries, archives and artists—and, yes, Guttman’s own. 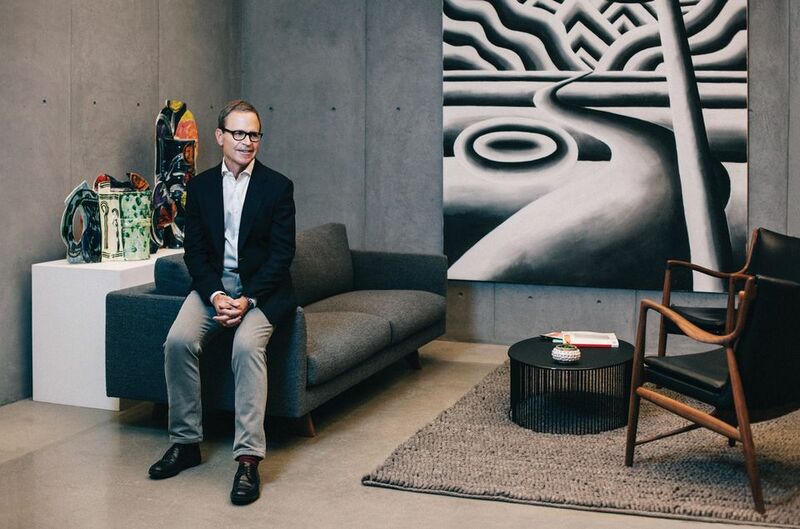 Reflecting his roving lifestyle, he serves on the chairman’s council of the Whitney Museum and is the chairman of the Centre Pompidou Foundation, the US friends group that supports the museum. But as much as he loves Paris and New York—Miami, where he has a home, is a favourite port of call. “The exciting thing about Miami”, he says, “is that it is changing all the time”. Steven Guttman: I have always had a passion for architecture and design. How various environments influence human behaviour and feelings fascinates me. As a real estate developer, I have taken great pleasure in creating settings that people enjoy experiencing. Art plays a vital role in most environments, so it seems quite natural that art would be an important part of my life. What was your first purchase for your collection? I was living in Washington, DC in the 1970s. The Washington Color School was the focal point of the local art scene at that time and, while I could not afford a painting by Morris Louis or Kenneth Noland, I was able to acquire a draped painting by Sam Gilliam—which I later donated to what is now the Pérez Art Museum Miami. My wife Kathy and I enjoy meeting the artists that we collect. There is no substitute for studio visits and gallery shows. Our participation with the Centre Pompidou Foundation gives us access to artists and curators, and has been most valuable in helping us make informed decisions on which artists to add to our collection. That’s a hard question to answer because the value of a work to us is not defined by money. Some pieces in our homes have been hanging for years and we couldn’t imagine living without them, although financially they don’t have extraordinary value. Collecting for us is about an emotional and intellectual connection. We find it exciting to put together a collection where the works are in dialogue. We are passionate about discovering young, new artists and also collect many historical artists. Some pieces that have a special meaning for us are a Gene Davis painting in the family room of our weekend home in Washington, Connecticut, and a Valentin Carron steel sculpture of a snake that is over the bed in our Paris apartment. If your house was on fire, which work would you save? I couldn’t imagine losing a work we own by Franz Kline, which is in our Miami Beach apartment. It’s a small work from 1954, which he painted on a page from the New York City phone book. It’s highly representative of his work, and it’s fun to make out the names and phone numbers in the background. With my other hand, I’d grab our silver Mallet-Stevens desk box on the way out. A major painting by Ellsworth Kelly. In recent years he has become my favourite artist of that generation, and I would love to own one of his monumental paintings. Which work do you regret not buying when you had the chance? When I first started collecting in the mid-1970s, the Max Protetch Gallery had recently opened in Washington, DC and was showing works by Andy Warhol, Donald Judd, Sol LeWitt and Carl Andre. I was attracted to the pieces, but I couldn’t quite get my head around their conceptual/minimal nature. Frankly, I was too uninformed and inexperienced. I didn’t buy a single piece and opted for “safer”, more mainstream artists that have long been forgotten. What is the most surprising place you have displayed a work? We recently installed a large work by Marguerite Humeau above an elevator bank and busy hallway at Uovo. It looks like six large eyes that follow you as you move. The work is about being monitored, which is quite fitting in a highly secure storage facility. There have been some strong reactions, to say the least. What’s the best collecting advice you have been given? Only buy what you love, which sounds like a cliché. But what nobody tells you is that the real challenge is figuring out what you love, what you don’t, and how your taste and collection evolve over time. The real winners for us are the works that challenge and resonate with us months and years after acquiring them.